You might notice a few things different about this issue. The new name plate on the cover marks the most noticeable change. There some new “department” monikers on the contents page as well. I sincerely hope you will appreciate our new look, but more importantly, you will take note of the things that did not change. 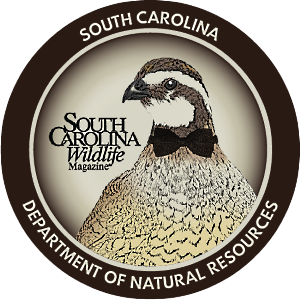 As in the past, South Carolina Wildlife continues to support the mission of the South Carolina Department of Natural Resources with exceptional photography, interesting features and some short news items. You will find articles for hunters and anglers, while other features may be of interest to bird watchers, gardeners or photographers. Beginning with this issue, we will regularly feature recipes that take advantage of wild ingredients such as game and fish. Some of them may be fancy, others will be for stews cooked outdoors in an iron pot. Photography has been the hallmark of South Carolina Wildlife for many years, and readers continue to tell us how much they enjoy the photo essays that offer armchair tours and adventures around the Palmetto State. Cultural history stories continue to be fan favorites, too. You can expect to see more of those kinds of stories in coming issues. So, although this issue may look different, as you flip through the pages and read the articles, the magazine will be familiar to you. We are still, the wildlife magazine you grew up with. Along the way, if you have a particular interest, let us know about it. Maybe it will be covered in a future issue. South Carolina Wildlife magazine receives some climbing tips from university professor and global expedition leader, Tom Mullikin. Follow along with Mullikin as he treks the globe to become the first human to climb Earth’s seven great mountain-summits and SCUBA-dive in all five oceans. More at scwildlife.com. Join past South Carolina Wildlife photographers as they reunite to celebrate the 65th Anniversary of SCDNR's flagship magazine. Learn about what it was like to capture the spectacular images of our great state throughout the years, then subscribe today at scwildlife.com so you don't miss a single issue.